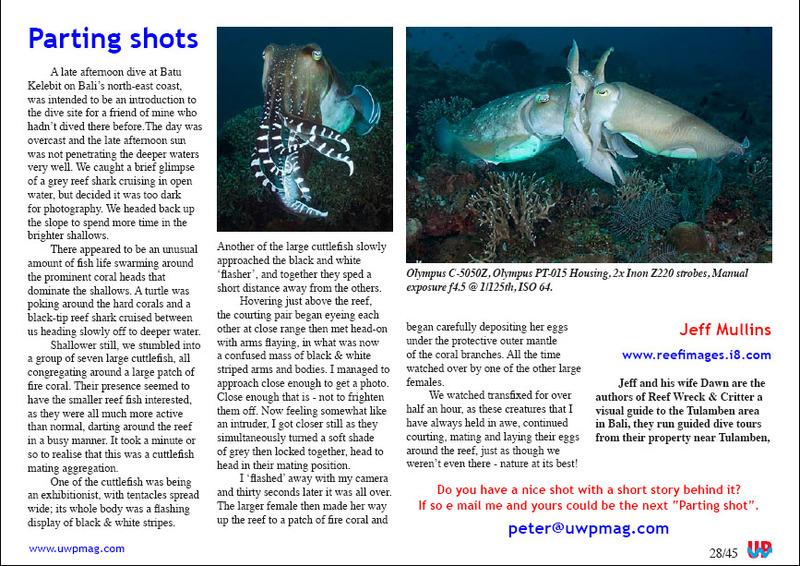 Jeff Mullins has been writing about Bali as a dive destination since 1988, he has also been contributing to﻿ Sportdiving Magazine﻿ since 1979. Published by Jeff & Dawn Mullins, this book is a pictorial guide to the varied dive-sites of Tulamben, Bali's number-one dive destination. Published by Jeff Mullins - in 1992, this book is now out of print, but is available from our website as a free PDF download. Note that this book is now outdated as far as facilities are concerned, but most of the dive site information is still relevant. Follow this link to Download a copy. Following are various magazine features on Bali and Indonesia compiled by Jeff for magazines around the globe. Some are able to be downloaded. All are copyright and cannot be re-used without prior written permission from Jeff Mullins, please ﻿contact us﻿ if you wish to use any part of these features or photos. USAT Liberty Wreck at Tulamben, Bali.